The finest hill-walking and scrambling routes on the mountains in Scotland's Southern Highlands. Hill walking routes in the Southern Highlands of Scotland are listed below starting from north and working southwards. The most southerly Munro. Quiet first thing in the morning and views are vast and superb from the summit. A rugged Corbett peak above vast areas of forestry. Fine tracks lead in, weird rocks higher up and plane wreckage ! A choice of good tracks in. 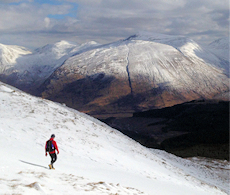 With grassy ridges, an excellent runnable route over 4 Munros can be enjoyed on clear days. A rugged Corbett above Loch Katrine. A real sense of remoteness here, although Ben Lomond is just around the corner. Good access paths and fences to follow making for two popular hills near Callander. Many different possibilities for accessing these hills, but from Edinchip they can be combined into a fine circuit. An enjoyable easy summer's afternoon walk heading direct up Ben Chonzie. Longer routes include the neighbouring Corbett Auchnafree Hill (coming soon). A terrific circuit, taking in 5 Munros. All summits in the range are fine vantage points for views over Rannoch Moor to Glencoe and beyond. On one side these appear as characterless lumps, from the other they have crags and rocky outcrops. A lovely ridge above Loch Tay, transforms into something serious in winter. Just bag the Munro, hike the complete ridge, or run it in a race - your choice ! 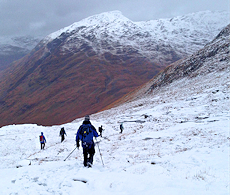 A long route taking in 7 Munros, but perfectly do-able for fit hillwalkers. Popular hills with a well managed path network to curb errosion on Ben Lawers and Beinn Ghlas.